I definitely love Dr.Mejia because he is passionate about what he does and has an excellent bedside manner. He is verythorough and is very detailed when explaining what your issues are, so you do not feel like you are a deer in headlights. I definitely love Dr.Mejia because he is passionate about what he does and has an excellent bedside manner. He is very thorough and is very detailed when explaining what your issuesare, so you do not feel like you are a deer in headlights. 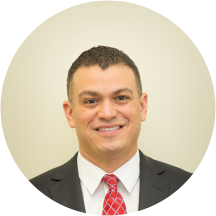 Dr. Luis Mejia is a detail-oriented and compassionate gastroenterologist serving the communities of Orlando, Clermont, and Kissimmee, FL. Dr. Mejia earned his medical degree from Pontificia Universidad Católica Madre y Maestra (PUCMM) Facultad de Ciencias de la Salud in Santiago. He completed his residency in internal medicine at Wayne State University. Dr. Mejia is a part of Dr. Srikiran Pothamsetty's practice and is certified in gastroenterology by the American Board of Internal Medicine. Because Dr. Mejia is bilingual in English and Spanish, patients from a variety of backgrounds enjoy having him as their physician. He sees patients for gastroenterology follow ups, biliary tract problem, and colonoscopy as well as other common and specialized reasons. Patients trust Dr. Mejia's expertise because he consistently provides high quality care that leads to positive and lasting health outcomes. Dr Mejia y really savvy on his field, very kind and polite. The doctor is excellent. The hours of appointment are not good. The office opened at 8am at the same tume that was my appointment. A lot of patients waiting outside until they open the doors. The pushed to get into theoffice and write there name on the clipboard. Some of the patients had appointment for 9am or later and they were called before my time. The front desk clerk was not friendly at all. Very cold but professional. The nurse was a bid cold at first but then later interacted better once I showed my friendliness and good attitude. The doctor was excellent!!!! His bedside mannerswere great! He was knowledgeable and very informative. I left feeling confident and with a sense of trusting him and his diagnose. I will continue to see him and have already recommended him. He needs to work on his office staff. The doctor as well as the staff are all very friendly and helpful. I was seeing Dr. Mejia at the office in Health Central. When I was informed that he was no longer there, I asked where his new location was.Since they would not tell me, I looked him up on the computer. I was so happy when I located his new office. He's an awesome Doctor. I wish he was Internal Medicine. He would be my Primare Care Doctor. Excellent, courteous, personal, highly recommended doctor, Dr. Mejia provided great service! I will definitely consult with him again. I was called back to the exam room almost immediately, the intake nurse was friendly and professional. Dr. Meija explained everything in easy terms without being condescending.